A bunch of stuff about game controllers is a new project I recently started with Laurent Bolli from Bread and Butter. The aim of the project is to focus and analyze "game pads" in terms of historical evolution as well as meaningful issues regarding their design. 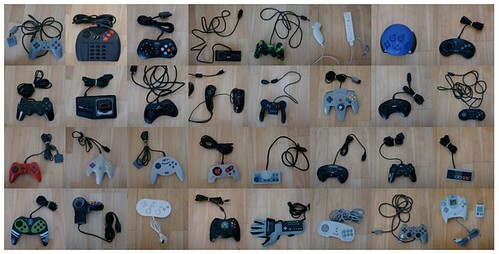 We collect lots of game-pads and will analyze them according to various issues, asking questions and drawing implications. The point here, from a research perspective, is to examine objects themselves. For once, in my UX work, it's less about how people use/what people do than "what do these artifact have to say about interaction design?" Will try to put my projects notes on this tumblelog. "The World As Seen From New York’s 9th Avenue"